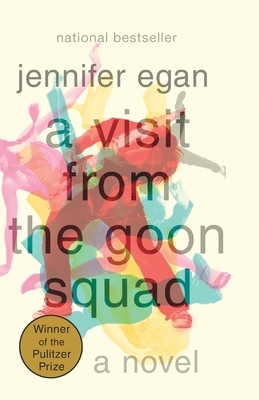 A Visit from the Goon Squad shifts among various perspectives, voices, and time periods, and in one striking chapter (pp. 234–309), departs from conventional narrative entirely. What does the mixture of voices and narrative forms convey about the nature of experience and the creation of memories? Why has Egan arranged the stories out of chronological sequence? In “A to B” Bosco unintentionally coins the phrase “Time’s a goon” (p. 127), used again by Bennie in “Pure Language” (p. 332). What does Bosco mean? What does Bennie mean? What does the author mean? “Found Objects” and “The Gold Cure” include accounts of Sasha’s and Bennie’s therapy sessions. Sasha picks and chooses what she shares: “She did this for Coz’s protection and her own—they were writing a story of redemption, of fresh beginnings and second chances” (pp. 8–9). Bennie tries to adhere to a list of no-no’s his shrink has supplied (p. 24). What do the tone and the content of these sections suggest about the purpose and value of therapy? Do they provide a helpful perspective on the characters? Lou makes his first appearance in “Ask Me If I Care” (pp. 39–58) as an unprincipled, highly successful businessman; “Safari” (pp. 59–83) provides an intimate, disturbing look at the way he treats his children and lover; and “You (Plural)” (pp. 84–91) presents him as a sick old man. What do his relationships with Rhea and Mindy have in common? To what extent do both women accept (and perhaps encourage) his abhorrent behavior, and why to they do so? Do the conversations between Lou and Rolph, and Rolph’s interactions with his sister and Mindy, prepare you for the tragedy that occurs almost twenty years later? What emotions does Lou’s afternoon in “You (Plural)” with Jocelyn and Rhea provoke? Is he basically the same person he was in the earlier chapters? Why does Scotty decide to get in touch with Bennie? What strategies do each of them employ as they spar with each other? How does the past, including Scotty’s dominant role in the band and his marriage to Alice, the girl both men pursued, affect the balance of power? In what ways is Scotty’s belief that “one key ingredient of so-called experience is the delusional faith that it is unique and special, that those included in it are privileged and those excluded from it are missing out” (p. 98) confirmed at the meeting? Is their reunion in “Pure Language” a continuation of the pattern set when they were teenagers, or does it reflect changes in their fortunes as well as in the world around them? Sasha’s troubled background comes to light in “Good-bye, My Love” (pp. 208–33). Do Ted’s recollections of her childhood explain Sasha’s behavior? To what extent is Sasha’s “catalog of woes” (p. 213) representative of her generation as a whole? How do Ted’s feelings about his career and wife color his reactions to Sasha? What does the flash-forward to “another day more than twenty years after this one” (p. 233) imply about the transitory moments in our lives? Musicians, groupies, and entertainment executives and publicists figure prominently in A Visit from the Goon Squad. What do the careers and private lives of Bennie, Lou, and Scotty (“X’s and O’s”; “Pure Language”); Bosco and Stephanie (“A to B”); and Dolly (“Selling the General”) suggest about American culture and society over the decades? Discuss how specific details and cultural references (e.g., names of real people, bands, and venues) add authenticity to Egan’s fictional creations. The chapters in this book can be read as stand-alone stories. How does this affect the reader’s engagement with individual characters and the events in their lives? Which characters or stories did you find the most compelling? By the end, does everything fall into place to form a satisfying storyline? Read the quotation from Proust that Egan uses as an epigraph (p. ix). How do Proust’s observations apply to A Visit from the Goon Squad? What impact do changing times and different contexts have on how the characters perceive and present themselves? Are the attitudes and actions of some characters more consistent than others', and if so, why? What does “Pure Language” have to say about authenticity in a technological and digital age? Would you view the response to Bennie, Alex, and Lulu’s marketing venture differently if the musician had been someone other than Scotty Hausmann and his slide guitar? Stop/Go (from “The Gold Cure”), for example?